to tweak Windows XP services in an easy, automatic and safe way. ...... It will turn off unneeded Windows services without affecting the normal function, this will make your PC run faster and more secure. Manual TuneUp gives you the power to optimize your Windows XP services in an easy, safe and advanced way without getting involved with services names and dependencies. Gaming Mode will give your system a performance boost. Unneeded Windows XP features will be temporary turned off to free up computer resources and concentrate computer power on programs you are currently using. 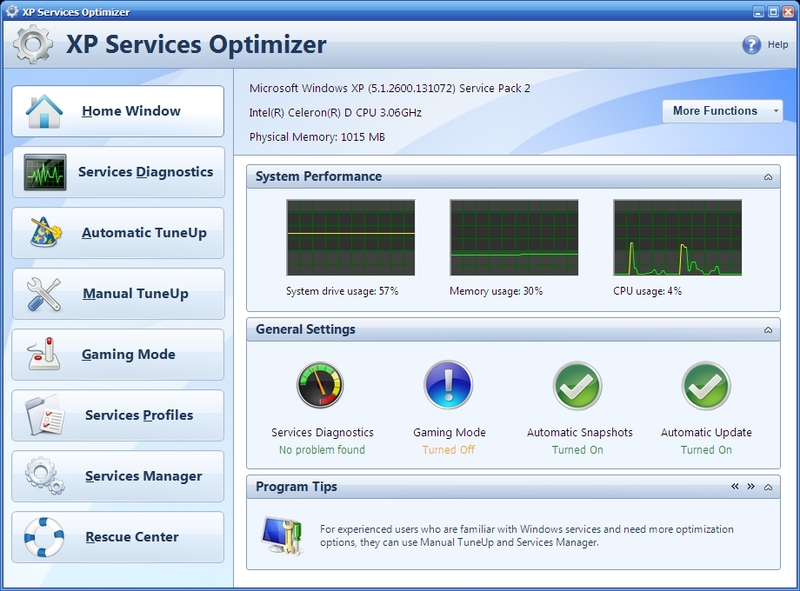 XP Services Optimizer can save your custom Windows services settings, enabling you to apply your different settings in seconds, saving you a lot of time specially when dealing with multiple computers or users. Qweas is providing links to XP Services Optimizer 1.0.52 as a courtesy, and makes no representations regarding XP Services Optimizer or any other applications or any information related thereto. Any questions, complaints or claims regarding this application XP Services Optimizer 1.0.52 must be directed to the appropriate software vendor. You may click the publisher link of XP Services Optimizer on the top of this page to get more details about the vendor.